Audiobooks are a great way to consume books in situations where you otherwise might not be able to do so. If you’re driving or exercising, reading a physical book would be impractical. But since you are probably listening to music when you perform those activities anyway, it can be a nice alternative to listen to an audiobook instead. Fortunately your iPhone is well-suited for audiobooks, and the Audible app makes it simple to access the books that you own through that service. 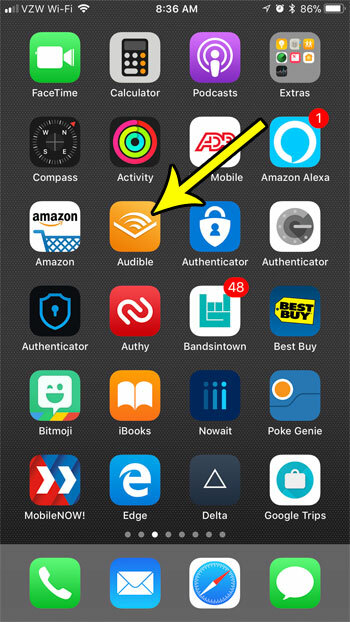 Our tutorial below will show you how to download an audiobook through the Audible iPhone app. The steps in this article were performed on an iPhone 7 Plus in iOS 11.2.2. Note that you are not able to purchase books from Audible through your iPhone. You will need to purchase the audiobook from your computer, at which point it will be added to your Audible account and available to download to the iPhone Audible app. Step 1: Open the Audible app. If you aren’t already signed into your account, you will need to enter your Audible account email address and password. Step 2: Touch the My Library tab at the bottom-left corner of the screen. 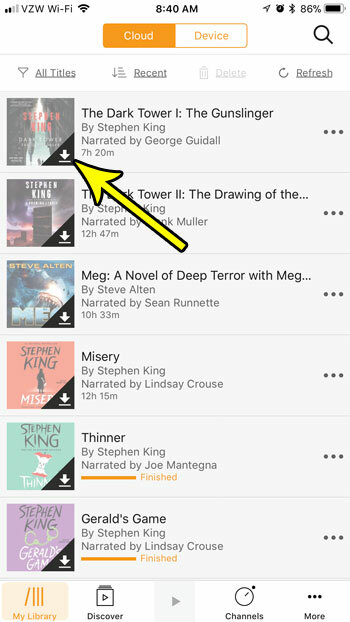 Step 3: Tap the audiobook icon at the left of the book that you wish to download. The audiobook will then start downloading. It will display the download progress in MB, and you will see an orange Ready to play indicator that enough of the file has downloaded for you to start listening to it. 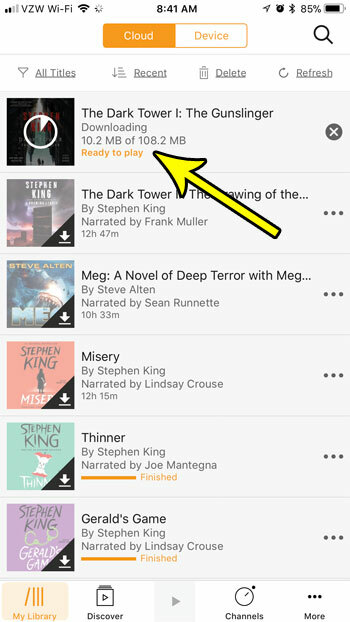 Audiobook files are much smaller than movie or TV show files, but they can still be many MB in size. Depending on the amount of free space you have on your iPhone and the number of audiobooks that you want to download, this could create a problem. Check out our guide to deleting iPhone files for some ideas on places where you can delete files to increase your available storage.